1. Go big and phone home: We’re an industry preoccupied with firsts, but sometimes we let practicalities get in the way of our big, audacious goals. 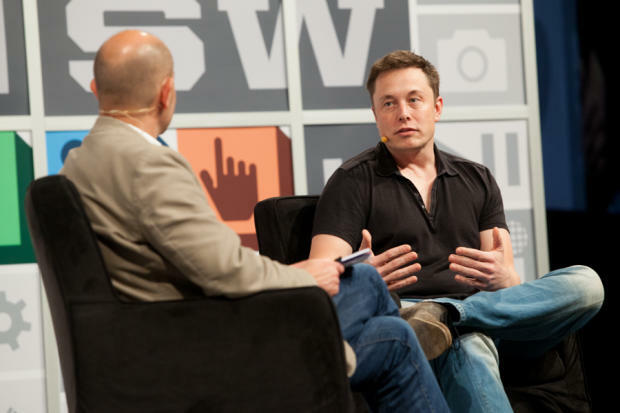 Keynote speaker Elon Musk is transforming three industries through his companies – space exploration (SpaceX), automotive (Tesla), and energy (SolarCity) – and he sees his mission as helping to make humanity an interplanetary species before Earth becomes uninhabitable [in about 500 million years or so]. If that’s not a big audacious goal, we don’t know what is. So the next time we let practicalities limit us, we’re going to think of Elon and go bigger. 2. #artcopycode: It has been about a half century since Bill Bernbach first thought to put copywriters + art directors together. Google thinks it’s high time we make technology just as central to the creative process – they call that model #artcopycode. 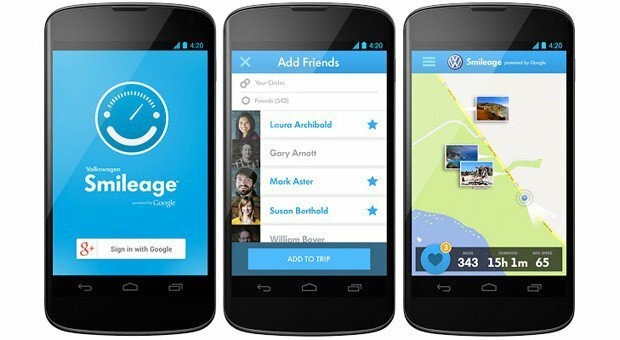 Their first experiments with the model were a talking sneaker and an innovative “Smileage” app for Volkswagen. 3. Tune in: It wouldn’t be SXSW if we didn’t discover a few local Austin bands to blast during late nights at the office. Emily Bell got us boot-scooting and Black Pistol Fire and Quiet Company inspired some rocking out over BBQ. We also met Rico Gagliano, who turned us onto his Dinner Party Download podcast – we recommend you check it out. 4. The signal + the noise: Nate Silver got to give a keynote, but we were more interested in smaller panels about how developers are using “big data” to separate the signal from the noise to create better user experiences. Wouldn’t it be great if you could say to Siri “book my flight to Austin” and it knew just what flight you meant, and what seat you wanted, and which credit card to use? The information is out there in your inbox, texts, credit card data, etc. – the trick is finding the right information and applying it the right way. Xobni CEO Jeff Bonforte thinks “robot apps” that can do this and more are in our near future. 5. 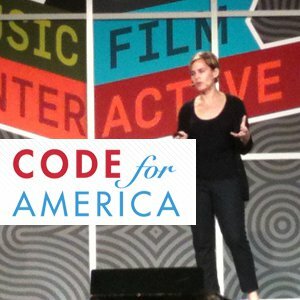 Speaking of big data: We heard how Code for America (aka, Peace Corps for Geeks) is using metrics and relatively simple technology to help cities work better, and at the same time, give their citizens more power. The secret isn’t in the code, but in the culture that allows for change. 6. Speaking of big data, cont’d: Dennis Crowley, founder of Foursquare, has A LOT of data. 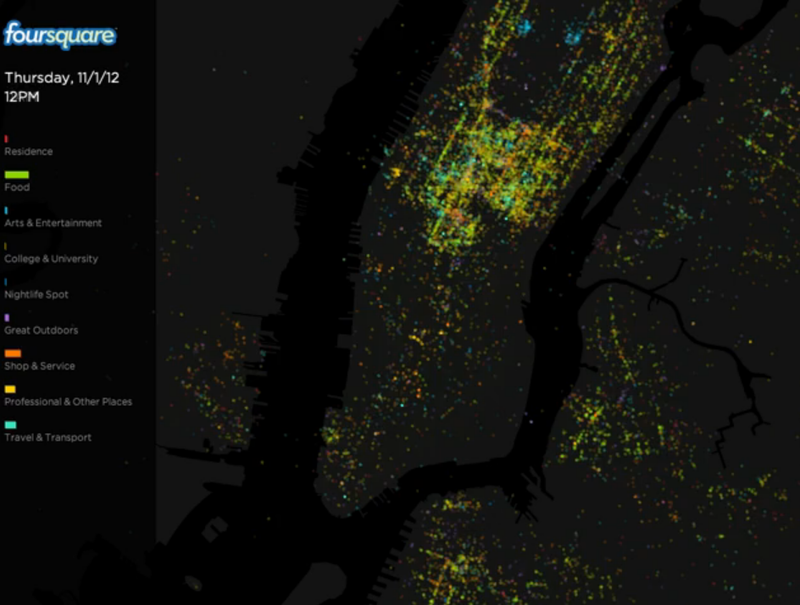 Through data visualization, he showed just one example – a time lapse of Foursquare activity in New York City during Hurricane Sandy. 7. Watch out for splinters: MakerBot CEO Bre Pettis wore an unusual coat to his SXSW Keynote. Turns out it was made of wood – and prototyped using a MakerBot 3D printer. We’re thinking we’ll see more unusual materials and design methods on the catwalk as 3D printing takes off. 8. Vine bears fruit: As you would expect, every moment at SXSW was documented by every mobile app imaginable. For the first time, that mix included newcomer Vine, a Twitter-owned service that lets users take and share 6-second videos. 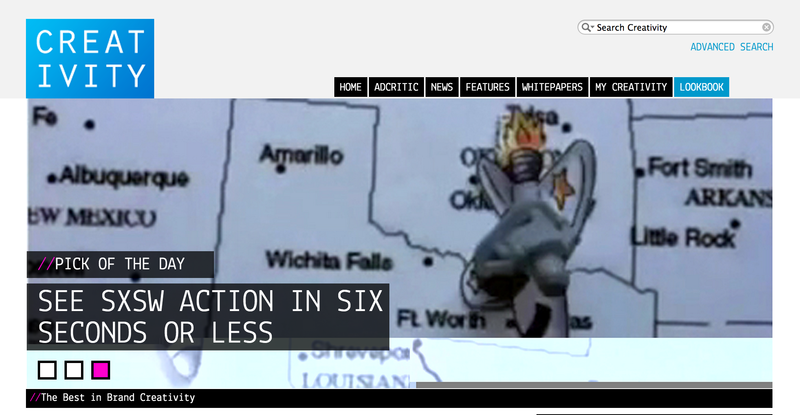 To tap into the excitement, SS+K created South by 6 Seconds, or SX6s, a website that aggregates Vines around SXSW and allows users to easily search + explore them – and it struck a chord with coverage on sites like Creativity and PSFK. We also used all of those Vines to create a highlight reel of the whole festival – it’s the next best thing to being there. Those were just a few of the highlights of a jam-packed four days. And we’re already looking forward to doing it again next year.